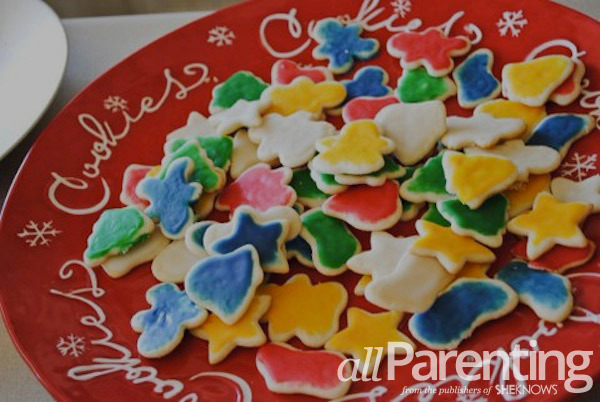 Cookie exchanges aren't just for the moms anymore! Invite the kids and even the hubbies to join in on this sweet celebration. In your cookie party invitations, be clear about the rules of the party. Make sure it's mentioned that kids (and Dads!) are welcome, note the amount of cookies/treats that each guest/party should bring and ask your guests to bring copies of their cookie recipe, as they are swapping at the party. With all the adorable and delicious sweet treats available this time of year, don't limit your party to just cookies. Think mini cheesecakes, brownie bites and cupcake balls — oh, my! Even if your type-A personality has your cookie exchange organized down to exactly which guests are bringing which types of cookies and how many cookies each guest should go home with, you have to expect that things don't always go according to plan... especially when there are kids involved! Set aside an extra batch or two of sugar cookies and extra frosting for the little ones to decorate, or set up a treat stick stand. How you ask? Set out lollipop sticks and sweets like marshmallows, rice crispy treat balls, shallow bowls of lukewarm, melted chocolate and white chocolate and toppings like crushed graham crackers, sprinkles, mini M&M'S and other small candies. Let the kids go nuts! Set out snack-sized plastic bags for take home. Now... get them away from the cookies! The kids will spend the entire party gobbling down sweets if you let them. So after a little decorating, move the kids along to another craft station, such as coloring homemade placemats or making cotton ball snowman decorations. A Christmas cookie exchange is not complete without a few staples: Christmas music, decor and food. Serving food other than just sweets is a must or your guests will be leaving with sick stomachs, in addition to dozens of cookies that they may not want to look at for a few days. But go light so your guests will have room to sample the sweets as well. Think easy and elegant appetizers (the make-in-advance kind) and a serve-yourself beverage station. In all honesty, some of the men might not be down for a cookie exchange (at first!) so make sure you have some out-of-the-kitchen activities for the guys. Set up a game of croquet in the backyard, turn on the big game in the other room or leave them to their own devices with an ice chest full of cold ones.